There is so much to delight and discover in The Marvellous Fluffy Squishy Itty Bitty that it’s hard to know where to start: the tongue-twisting title, the Paris streets and old shops windows crammed with things everyday things, the eye-popping pink highlights…Here is a classic picture book that readers from three and up will read again and again with delight. It will go a long way to making Beatrice Alemagna as well known to English language readers as she is in Europe. Edith, 'but my friends call me Eddie', is five and half years old. She lives in Paris with her vastly over-achieving family (father speaks five languages, mother a beautiful singer, sister, brilliant ice-skater), leaving little room for Eddie to shine. But, as her mother’s birthday approaches, our straw-haired heroine sees the chance to find an absolutely knockout present. But just what is a 'marvellous fluffy squishy itty bitty? And what could Eddie's mother do with it anyway? There’s more than a hint of Amélie in what unfolds in Eddie’s quest for search a Fluffy Squishy Itty Bitty, a phrase that Edith overhears and makes as her quest. Like Amélie, Eddie is something of an outsider, with the goal of bringing happiness to others. There’s also strong sense that this is a book where the child is in charge as Eddie goes on her mission. 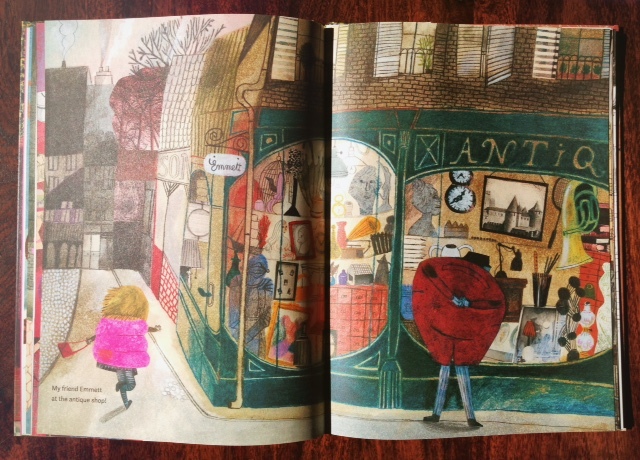 Eddie visits a boulangerie, a florist, a thrift shop, an antique dealer and a butcher. While each store offers a gallery of objects and items, it’s the butcher that is the tour-de-force. There is even a fold-out page that displays hanging pigs head, various fowl, hams, sausages and meats. Paris – as a city, as a set of images and scenes – is so worked over that it would be very easy indeed to present the reader with a checklist of those familiar sites and sounds. Beatrice Alemagna stands out from the crowd, creating fresh, vibrant moments, textures and tones that hold the eye and vivify the story. This Paris is not shiny and chic, it’s more lived-in, human and warm. One other thing that is striking about The Marvellous Fluffy Squishy Itty Bitty is the almost unlimited freedom allowed to Eddie. She needs to acquire a present? Off through the streets she goes! This degree of freedom is completely unremarked and natural. Here’s a book that would, I suppose, scare the hell out of literal-minded parents, but one that is also a quiet celebration of community and a child's ability to imagine, explore and create. What Alemagna also does is very delicately and engagingly introduce the young eye to new ways of seeing. Her images are richly yet subtlety layered, or embedded, with details. Indeed, the story itself is a sort of treasure hunt, as Eddie gathers her mismatched gifts. Somehow these gifts, usually thrust upon her by misunderstanding adults, allow Eddie to complete her quest. Alemagna exploits the possibilities perspective with sightlines skewwhiff suggesting the child’s restless energy. There’s an easy and appealing cubist twist to her artwork, making it both visually interesting and lending an informal, human note. Alegmana uses gouache, pencil and collage, finely balancing colour for dramatic effect. It took nearly five years for Alemagna’s book A Lion in Paris to appear in English. This one has been far quicker, spurred by the success of the earlier book. The Marvellous Fluffy Squishy Itty Bitty might just be the breakout book to make English readers really get to know this marvellous, original, subtle, accomplished artist. Beatrice Alemagna was born in Bologna, Italy, in 1973 and now lives in Paris. From the age of eight she knew that she would be make picture books. She first attended the Bologna Book Fair aged 14 and received early encouragement from Tomi Ungerer. Beatrice is the author of more than 20 books, most of which were published initially in France. Her books have been translated into French, Italian, Spanish, English, Dutch, Czech, Slovenian, Greek, Taiwanese, Korean, Portuguese, Brazilian-Portuguese, Chinese and Japanese. Other books in English include: Little Big Boubo (Tate Publishing), the 'Bugs' books (Phaidon) and The Fluffy Squishy Itty Bitty (Thames & Hudson). In this short film Beatrice Alemagna talks about her book What is a Child? and reveals some of the ideas that drive her.